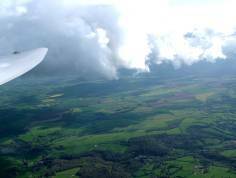 Our trial gliding lesson is a brilliant introduction and is ideal for almost anyone. It makes a great gift – something a little out of the ordinary. Age is no barrier; we have flown visitors from their early teens to 101 years old. Your gliding experience will start with a briefing by one of our fully qualified gliding instructors who will explain all of the safety aspects of your flight and also introduce you to the aircraft and make sure you comfortable. The glider will then be towed behind a light aeroplane to a height of 2000 feet from where you really can get a bird's eye view of the Cotswolds, an area of outstanding natural beauty. During the flight you will be invited to take the glider controls or you can simply sit back and enjoy the ride while the instructor flies. If you like you can record the flight on your camera. The flight will generally last about 15 minutes but can be longer if the weather conditions permit. We also run popular summer evening gliding for groups. Read more here. When you buy a trial lesson from us you will receive a voucher that you can give to the recipient. We send this out by first class post, usually within one working day. The person taking the glider flight can then contact our office to book their lesson at a time convenient to themselves. The voucher is valid for twelve months from purchase and is non-refundable or transferrable to another club. It entitles you to one flight on either a Saturday or Sunday, weather permitting. Full instructions for booking will be supplied with your voucher. A trial lesson costs £85. Please note that there are size and weight restrictions – see below or call our office on 01285 760415 for full details. Age. Children under 16 must be accompanied by a parent of guardian and meet the minimum weight below. Weight. Due to aircraft limitations we cannot fly with anyone over 110kg (242lbs), fully clothed and wearing a parachute (7kg). The minimum weight is 45kg (100lbs). Very tall people, more than 1.9m (6ft 3ins), may have difficulty fitting into the cockpit. Our FAQ explains more. Health. Visitors must not have any medical condition that might lead to a difficult or dangerous situation in flight. Please check with our office if you believe you may have a condition that will be problematic.